Jeff For Banks: The coming bank consolidation... but not why you might think. The coming bank consolidation... but not why you might think. If I had a nickel for every time an investment banker predicted the mass consolidation of our industry I could buy a free round to all attendees at next month's Financial Managers' Society Forum. Financial Institutions need greater scale to offset the rising regulatory burden imposed by Dodd-Frank and soon to be imposed by the Consumer Finance Protection Bureau (CFPB) is the most often cited reason. But I have noticed a couple of trends that may be a better leading indicator of coming FI consolidations, one old and one new. The old reason is that our CEOs are old... pun intended. Prior to the 2007 financial crisis, we prognosticators used to look at CEOs age as an indication of whether a financial institution would sell. 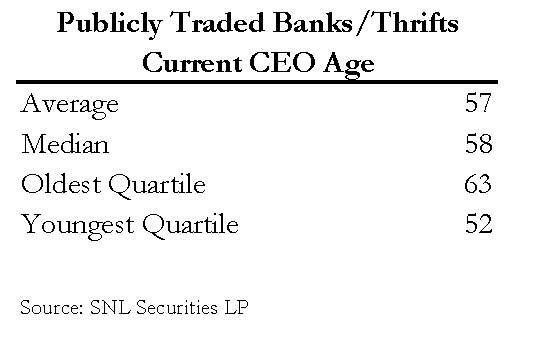 See the table for the average age of FI leadership for publicly traded banks and thrifts. It tells a challenging story... one quarter of FI CEO's are two years from retirement. Half are seven years away. Are there successors in the wings? I have not read one press release announcing a merger that stated: "Our CEO is old, we have nobody to replace him, so we sold." But the cynic in me says this reason stands tall in prominence in the Board meeting when the sale decision is made. This could be because the CEO does a good job, and neither the CEO or the Board thinks there is another potential CEO candidate that can do as well. If this is the case, then I put to you that neither the CEO nor the Board has done a very good job of developing leadership in the organization making successful next- generation passing of the baton doubtful. The cynic in me suspects there may be no opportunity for the retiring CEO to unlock the value of his investment in the FI without a sale. But there are exceptions, such as how Wayne Bank in Honesdale, Pennsylvania implemented a leadership change flawlessly. 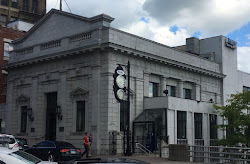 Bill Davis, a great banker who never thought the success of the bank was all about him, moved out of the executive suite on retirement day and passed leadership to his second in command, who had been groomed from within. See the link below for the jfb post on Bill Davis. The newfangled reason for the coming consolidation wave, in my opinion, is the change in our shareholder base (see chart). Community FIs used to have very predictable shareholders. They were typically within our communities, liked the dividend, and were proud to own a piece of their local bank. Having gone through a few consolidation waves, our shareholders have become more diverse. They're also becoming older, and many have already passed shares to the next generation that lacks that same connection to the bank. Lastly and possibly more importantly, FIs have needed capital during the past few years as loan problems and operating losses have reduced industry capital ratios. We turned to the most prominent underwriters of community FI stock, Sandler O'Neill, KBW, and Stifel to replenish our capital coffers. Where do these underwriters place the community bank issues? With institutional shareholders such as asset managers, hedge funds, and the like. These institutional shareholders have little interest in what you think you mean to your communities or employees. They plug in the number they bought into your shares, and expect a certain return. If you can't deliver the return via profitability, then you better sell to give it to them. These shareholders at times own a relatively large percentage of a stock that doesn't trade heavily. In these instances, it would be difficult for the institutional shareholder to exit the stock through any other means than a sale. Yes, those that successfully raised capital in the past two years are proud that they have done so. But I wonder if, while basking in the glow of that success, they understand that they may have sealed their fate far in advance? Do you think there will be an increase in FI consolidations? Why or why not?